One word to describe today’s hike: treacherous. I didn’t fall once, nor twice. No, not even three times, but EIGHT times in one day. More on that later. As we were getting ready to leave the shelter this morning, we spotted five deer nearby. Although I’ve see a lot of deer before, these deer were different than the ones you see in Maine. They weren’t scared of us at all and we quietly observed them as they walked around the shelter area. This was also our first wildlife sighting of the whole hike, so it was a good moment to start the day off with. We reached a couple of milestones today. 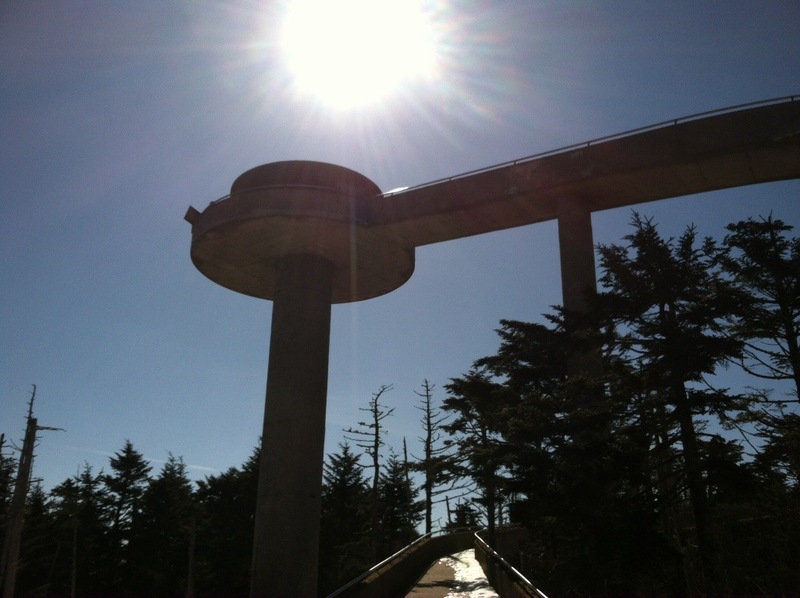 We climbed Clingmans Dome, the tallest mountain on the AT and we reached the 200 mile marker. It was icy and cold as we reached the top, but there were clear skies for miles. We climbed to the top of the tower so that we could take in the 360 degree views of the Smokies and of the surrounding mountains. 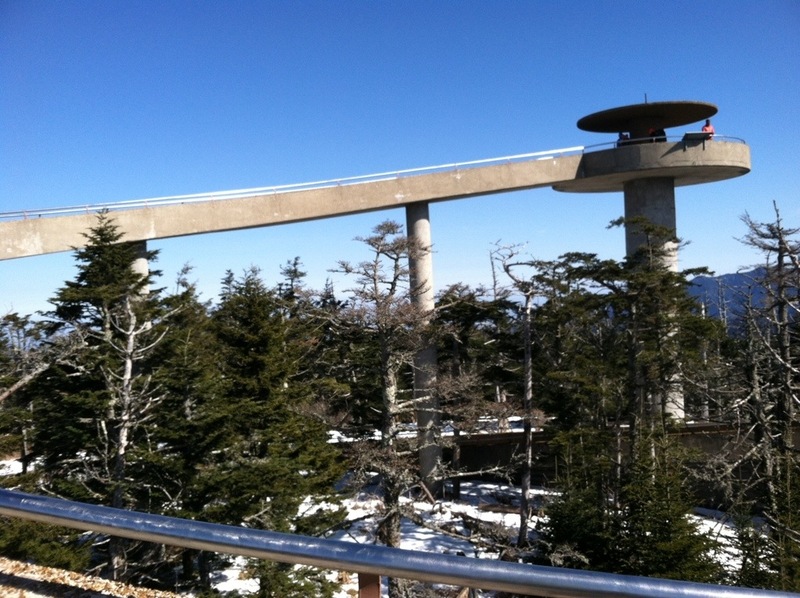 It was awesome to see the progress that we’ve made so far looking south from Clingmans. 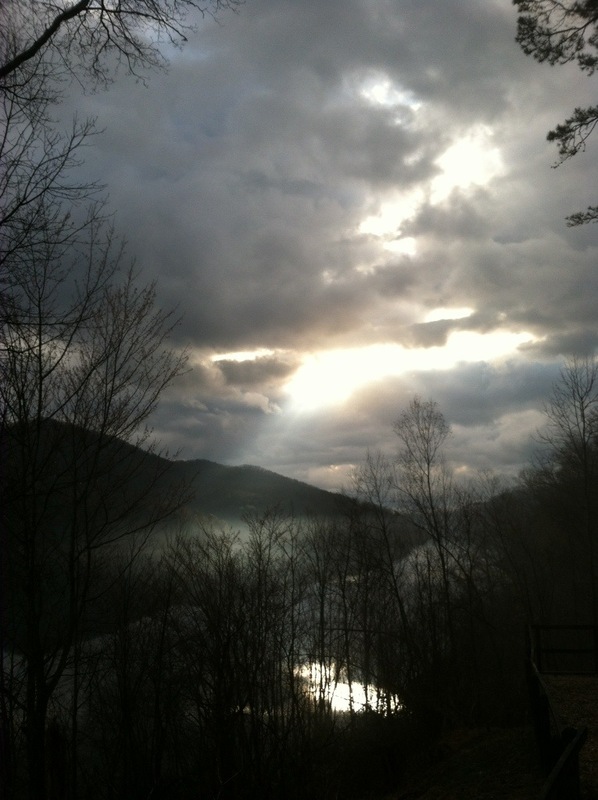 We could see Cheoah Bald and Standing Indian from the top, two mountains that we’ve hiked in North Carolina. As I stood atop the mountain that looked so daunting the other day miles away on Wesser Bald, I realized how amazing the Smokies have been so far and not so scary after all. That is, until we descended Clingmans Dome to Newfound Gap. I’m not joking when I say that almost the entire trail we hiked today was covered in thick ice. At such a high elevation and with most of the trail shaded by the trees, the snow had turned to ice and we had no choice but to hike down the slippery slope. It was tough hiking on the ice because you have to be 100% on your game or else you’ll slip and fall. And even if you are concentrating solely on your foot placement, you’ll still fall. Even Miles fell twice today. As I said earlier, I fell eight times. 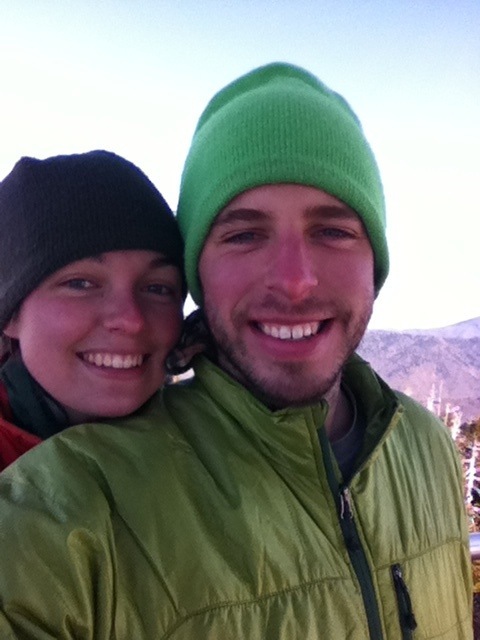 At first, we laughed at each other’s slowmo and sometimes cartoonish falls. But after the fourth or fifth fall, it wasn’t funny anymore. It was frustrating. The last time I fell, I wanted to cry and get out of all the damn ice and snow that we couldn’t seem to escape from the entire day. However, I didn’t cry and I hiked faster so I could reach the promise of pavement sooner rather than later. 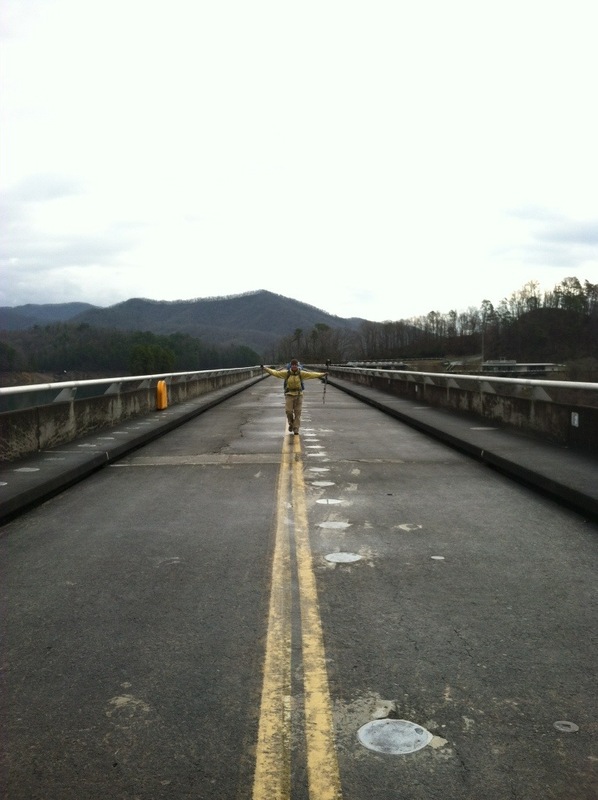 When we did reach Newfound Gap, we were awarded handsomely. Mamaw B was there waiting for us with snacks and drinks along with two other trail angels, Beth and Bernie from Florida. As soon as Beth saw me approaching the gap, she started making up a sandwich for me. It was a welcome sight after such a hard day. There were even Woodchuck ciders in the cooler, which was nothing short of amazing. 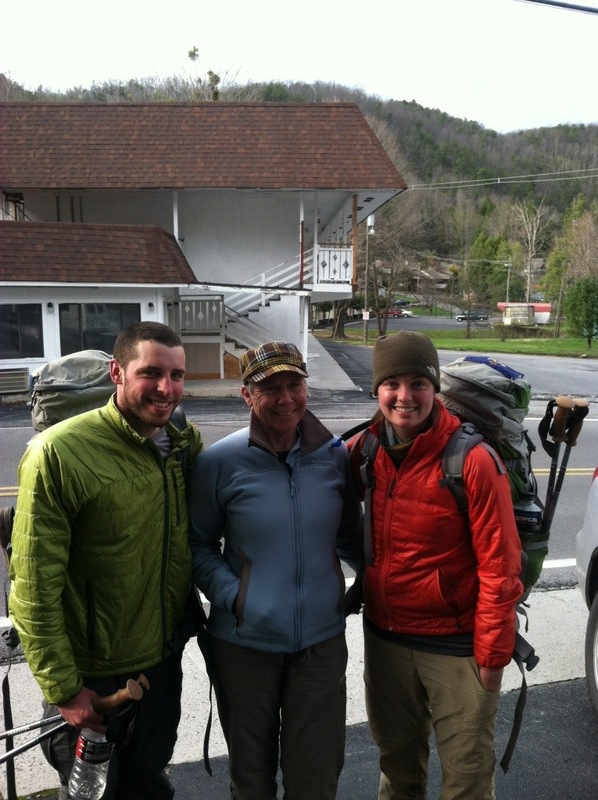 We had a great end to the afternoon hanging out with Mamaw, Beth, Bernie, and a few of our fellow thru-hikers. 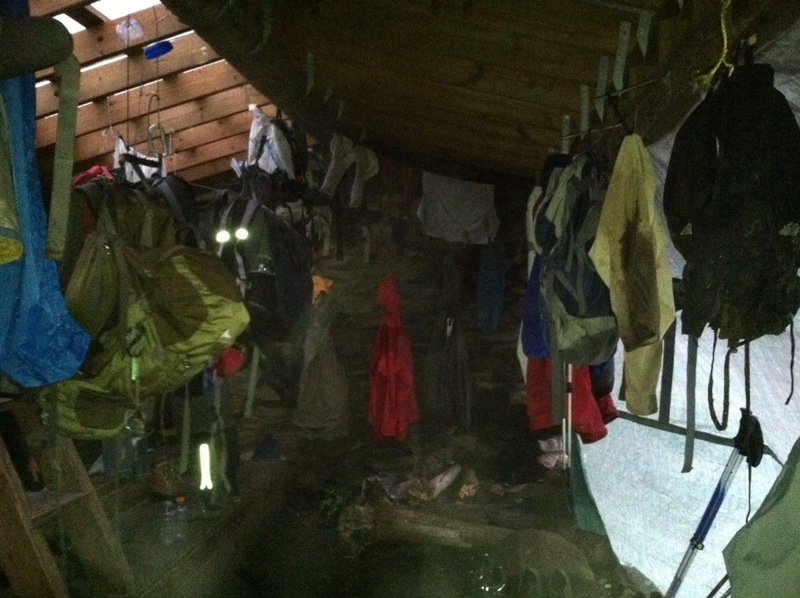 Thanks Beth and Bernie for the amazing trail magic today! Mamaw gave us a ride into Gatlinburg to a motel with Hiccup and Forge. We sure are grateful to Mamaw B for all she has done for us. If I haven’t said it already, she’s pretty awesome. We got in a hot shower, did laundry, and had a good dinner at the brewery here. Gatlinburg is an interesting town. Not sure if I’ll ever be back here, but it works for us! Warm bed, hot shower, and full bellies. What more do you need? Back to the trail tomorrow. 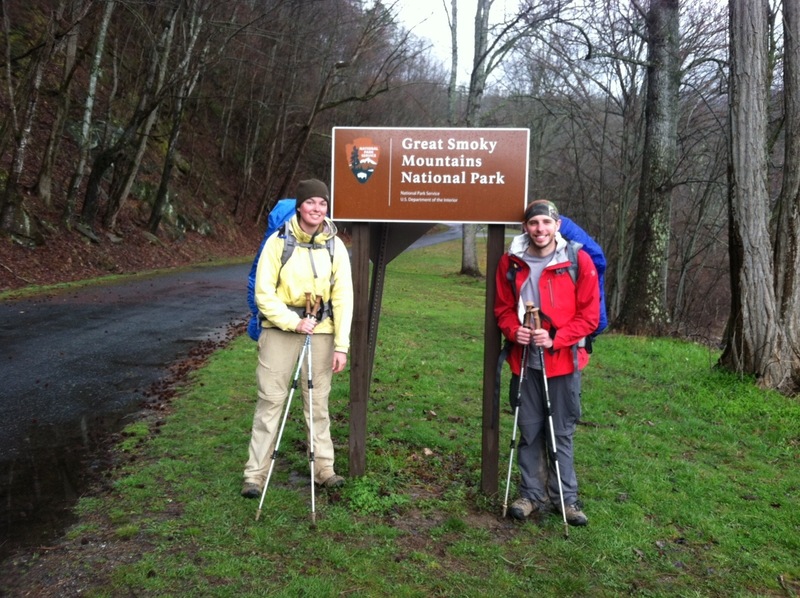 We’re halfway through the Smokies and looking forward to the rest of our time in the park. Reception is pretty much non-existent in the park, so don’t be surprised if you don’t hear from me for a few more days. She is very awesome! She told us about spending time at the lodge this past winter. Thanks for reading! Keep an eye out for Mark Sanford. Love reading your journal and seeing the pictures. I enjoy reading about your progress. Good luck and safe travels. Hopefully the bad weather is behind you.